Whilst writing this post I have been distracted by the likes of french connection, mango, sian's youtube, asos and more - why must I want so many beautiful things?! I'm going to have to start some savings in order to buy every item on my many wish lists. Speaking of which, I was getting distracted again ..There are so many fab neon accessories out there at the moment and i'm excited to get my hand on a beanie or two, some belts, polishes and even a clutch bag. The neon trend is one that i'm feeling brave enough to hit, though maybe not in full on dress terms, i'm not feeling that brave! Taking inspiration from some fabulous blogger friends, I have hunted down (and ordered, shh) some neon treats for you to feast your eyes upon. I think Kavita from She Wears Fashion might just be the queen on neon styling, did you see how much she got papped at London Fashion Week? Mental! ♥ Anyway, I love the way that she's worn everything and these are outfits that i'll take inspiration from. I also love a bit of Saraluxe neon style in her bright jumper dressed with mostly black, I think if I were to be brave enough for a neon jumper then wearing it with leather trousers or my french connection jacket would be perfect! 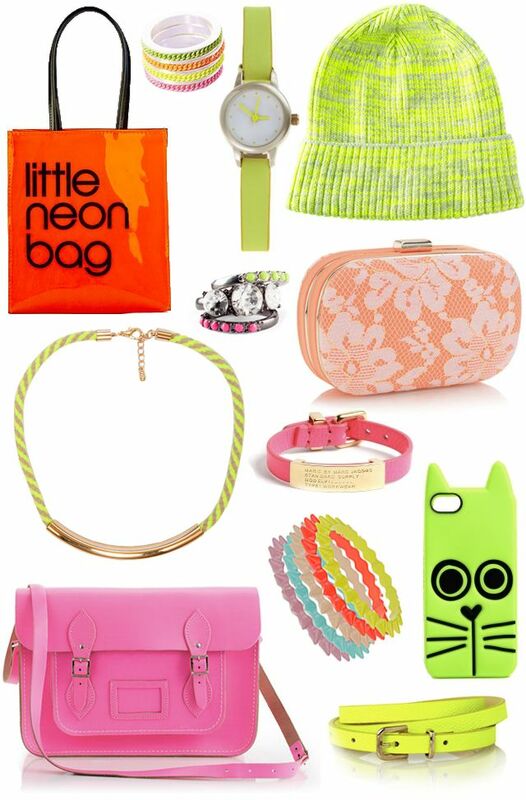 I love neon at the moment and its not normally my thing, the phone case is ridiculously cute! !